The first few days of January are usually crisp and cold in Gettysburg. Sometimes there is frost or snow, sometimes not. Sometimes there is a bitter wind, sometimes not. Sometimes there is sun bleeding across the horizon and splashing a cloudless sky, sometimes there is not. But the new year here, like everywhere else, stands as a symbol of promise and hope for the future. And nowhere, during those bitter cold first few days of January, 1864 needed hope more than Gettysburg. For the many Lutheran men and women milling through the streets, the language of John of Patmos' Revelation might have been the most honest description of the last year. "Go your ways, and pour out the vials of the wrath of God upon the earth." Gettysburg had been drenched in wrath. But even in the slowly healing craggy wasteland that surrounded Gettysburg, there was hope. And unlike John's vision of the great showdown of heavenly host, this hopeful message rhymed. Fell nobly fighting for the Nation's life. For the men and women who lived here, the meaning of their struggle of the last year was abundantly clear. In the "Carrier's Address to the Patrons of the Adams Sentinel," in the newspaper's first issue of 1864, the meaning of battle at Gettysburg was laid out for anyone who cared to follow the lilting verse. 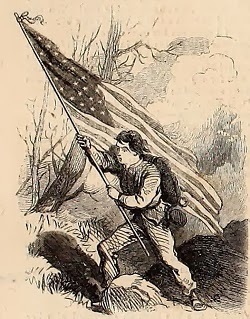 Stanza after stanza whips by, as the poet describes how, when the rebels plowed through the fields, "with their flag of 'bars,'" the heroes of the townspeople had flying over their shoulders, "the gallant 'stripes and stars.'" A clash not unlike that in Revelation had happened here, as "host met host." Yet still, "like old Ocean's rock, / Our boys withstood the fiery charge and shock." The sainted sons of the United States prevailed, "and Heaven smiled as we the victory won." Then the poet pivots, because this town had seen so much more than just three days of carnage in the past year. Those burning few moments of carnage had only been 4/5th of a percent of the year's days, hours and seconds. But those fleeting moments of fire shifted the course of all the months which followed. Suddenly, the poet brings down upon Gettysburg not armies, but throngs of visitors. We are standing in November. And we start to see the meaning of it all — Freedom. The scene is changed! What means this concourse vast? Has some bright fairy's wand been o'er us cast? Each from their far and distant home. Who nobly for our Union their blood shed. Gettysburg had been etched into eternity, the name of a place forever known for a few simple acts: killing and speaking. But the future was still unclear. How soon, "Disunion's swelling flood," would take to crest and fall again was still unclear. "But if the cloud that now dark o'er us lowers, Should burst upon us its ensanguined showers," the Carrier assured the borough, "Yet like the far-famed Nazarite of old, We to the pillars of the fane shall hold, And the same shock that ruin round us throws, Shall hurl destruction on our common foes." Gettysburg had seen the worst of war. But something else had sprung from that bloodsoaked stem: hope. The war, for much of the nation, had seemed to change in that first week of July. The carnage was awful. The loss was appaling. But out of that destruction, there seemed the glimmering light of an oncoming dawn. Like a small glowing ember, it must be kindled into a flame, then a fire, but it was there. If this small town of a few thousands people could find their hope in the bloodsoaked ground outside their doors and the bloodsoaked shirtsleeves which hung around their wrists half-a-year earlier, there was hope enough for the nation. War was far from over, but if Americans kept blowing on that ember, cupping their worn, calloused and bloodstained hands to its feeble warmth, the great fire of peace might again blaze in the hearths of the nation. 1864 would be another long year of war. It would prove to be the war's last long year. But for the men and women standing in Gettysburg's frigid streets on New Years Day 1864, that war had no end yet. It was an eternal war. And peace was still a long ways off.